The oldest of 13 children, Mike Ritchie majored in civil engineering and joined the U.S. Army Reserve while at the University of Kentucky. Upon graduating in 1972, he began working for GRW Engineers, which, not long after, acquired a photographic surveying and mapping firm based in Lexington. The acquisition was Mr. Ritchie’s foray into the field of aerial mapping and during the 17 years he was with GRW, Mr. Ritchie learned everything he could about the industry. In 1990, he joined a similar aerial mapping company called Photo Science of Kentucky, Inc., (now Quantum Spatial) and bought the company later that year. Under Mr. Ritchie’s leadership, Photo Science became one of the largest geospatial solutions companies in the U.S., increasing revenue from $1 million to $42 million annually. Photo Science’s operations expanded to nine regional offices across the U.S. with a staff of over 200 employees comprising professional engineers, software developers, land surveyors, mapping scientists, geographers, data analysts and more. To meet the demand for their services, Mr. Ritchie built an aerial fleet of 13 FAA-certified planes outfitted with precision digital sensors, airborne Global Positioning Systems (GPS) receivers and gyro-stabilized camera mounts. From low-altitude acquisition for engineering applications to data collection for federal government program use, Photo Science’s sophisticated photogrammetric mapping capabilities routinely earned unique job requests such as flying the Grand Canyon 3,000 feet below the rim of the canyon to capture images of endangered species, providing aerial imagery of southern Mississippi after Hurricane Katrina to help officials assess damage to the area and employing brand new technology to collect imagery from Texas to New Jersey for a petroleum company pipeline. Photo Science’s client portfolio ranged from private businesses to transportation cabinets and other federal government contracts. During his time as president and CEO, Photo Science won numerous national awards for its work, including the American Consulting Engineering Council National Engineering Excellence Award in 2003 and 2011. 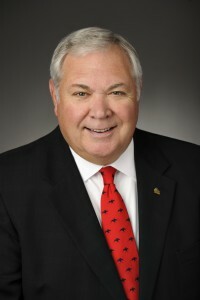 Mr. Ritchie has served as president of two national councils and president of three state councils and foundations, including the Kentucky Society of Professional Engineers. In 2008, he was appointed by President George W. Bush to advise the federal government on how to implement geospatial technology. Prior to that appointment, he had been appointed by Kentucky Governor Paul Patton to the Kentucky Geographic Information Systems Advisory Council. He currently serves on the college’s Department of Civil Engineering advisory board. In 2013, Photo Science merged with two similar companies in the U.S. to form Quantum Spatial, Inc., the largest company of its type in North America. Mr. Ritchie served as Quantum Spatial’s chief operating officer until his retirement in 2014. A licensed professional engineering in 16 states, a licensed surveyor in nine states and a nationally certified photogrammetrist, Mr. Ritchie provides a variety of consulting services and remains an active member of the engineering community. Mr. Ritchie lives in Lexington, Ky., with his wife, Jo Ann. They have two sons, Michael and Derrick.